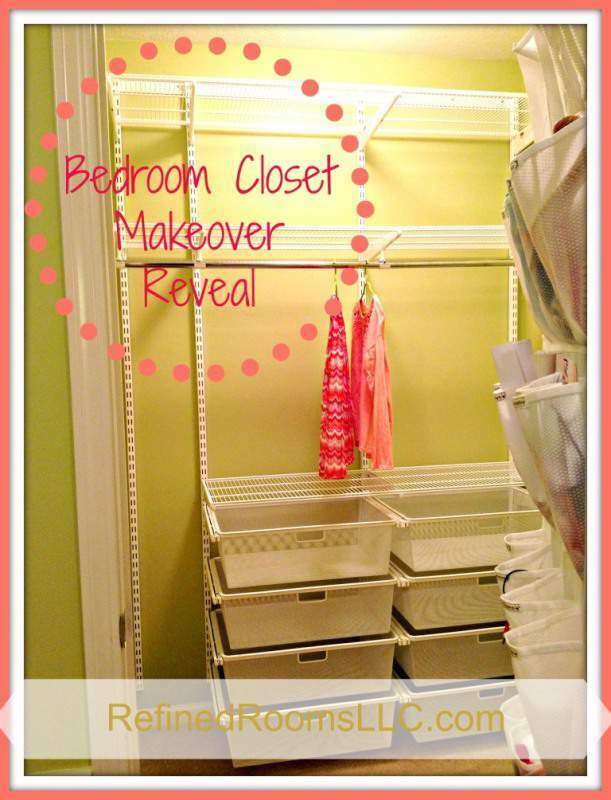 Organizing the Organizer: Bedroom Closet Makeover "Reveal"
If you are a regular blog reader, you probably remember my Guest Room Closet Makeover Reveal from February of this year. 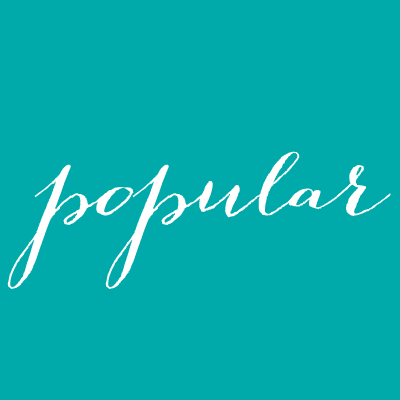 In that post, I confessed that there are several areas within my own home that are crying out for an organizational overhaul. 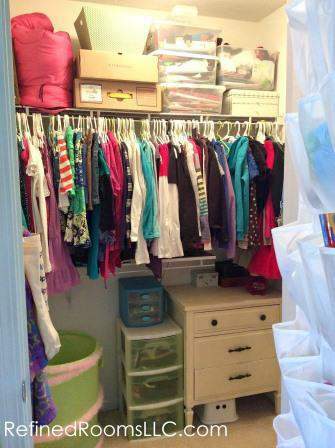 One such space was my daughter’s closet. 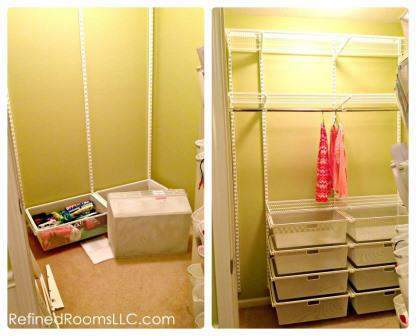 Although the closet is fairly large, the space wasn’t being utilized to its full potential. Storage containers consisted of a mishmash of old, inherited furniture pieces, random plastic drawers, and cardboard boxes. To make matters worse, all of the hangers were the plastic ones that we brought home retail stores along with our clothing purchases. Once again, here’s where the Container Store comes to the rescue! As you all know, I am a huge fan of the Container Store’s Elfa storage systems (read here to learn why). I spoke with an Elfa design consultant by phone, and together, we arrived at a design that would work for my daughter’s storage needs. Her need for drawer space trumps her need for hang space, so our design incorporated a whopping 8 Elfa Mesh Hanging Drawers. Our design also incorporated an additional shelf that allows for out-of-the-way storage of items that are seldom accessed (e.g., memorabilia). So the transformation began with the removal of the builder-installed stationary shelves. I prepared myself for the inevitable ginormous holes that result from this process. 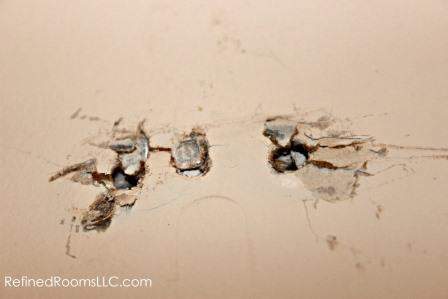 Nothing that a lot of spackle and some paint can’t conceal! Yes, that’s right. I said paint. I took advantage of the opportunity to add a fresh coat of paint to the closet walls when it was emptied prior to installing the new shelving. 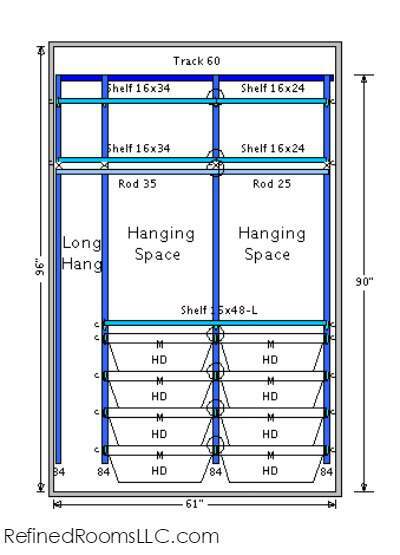 Installing an Elfa closet system was a piece of cake; the Container Store walked me through each step of the installation process via their online video tutorials. I installed this on my own over the course of approximately 2 hours. Ready for the “Before & After” shot? By far, my favorite part of the “makeover” is the Elfa drawers. Unlike the drawer systems that I used in the guest closet (which were the freestanding type), these mesh drawers are built into the wall track system via a hanging drawer frame. 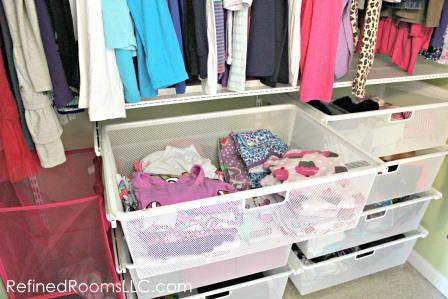 They glide open effortlessly, and provide more than enough space to store my daughter’s pajamas, t-shirts, sweatshirts, off-season shoe collection, and her assortment of purses and tote bags. As you can see in the photo below, there was just enough room to squeeze in a cool square mesh hamper. 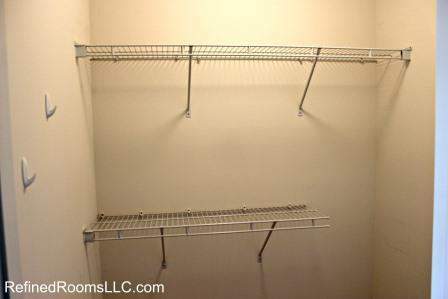 We made use of the walls on either side of the closet system by installing several Command Hooks. 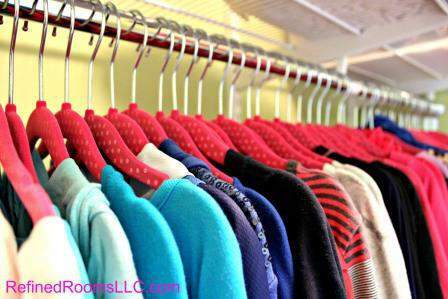 The hooks are used to hang my daughter’s scarves, robe, and Girl Scout vest. 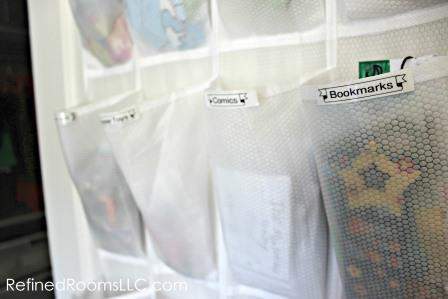 The right wing wall contains a cute cork board for her to use as additional display space in her room. Did you actually think I was going to use that mismatched collection of plastic department store hangers? Surely you jest. Who could pass up these adorable kid-sized huggable hangers? One component of the original closet set-up that continues to work like an organizational charm is this over-the-door shoe organizer. 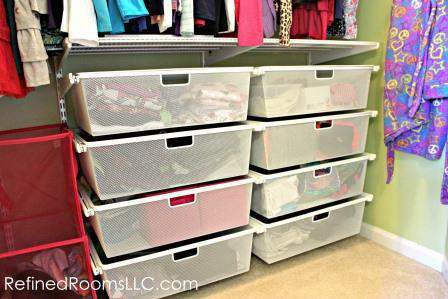 This tool is one of the most versatile organizing products around! For this space, the compartments are used to store small toys and trinkets that would normally invade all of the flat surfaces of my daughter’s room. I typically opt for the clear shoe organizers, but I couldn’t pass up this opaque one when I found it on clearance. It was just a matter of labeling the compartments to ensure that items are returned to their proper home. 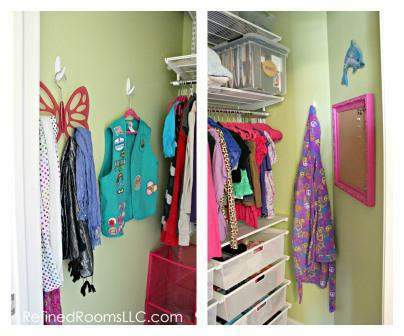 My daughter was so ecstatic about this closet makeover that she asked me for a bedroom makeover for her birthday gift earlier this year. It only took me 10 months, but I finally completed that project! If you’ve been inspired to tackle your own closet organizing project, The Container Store’s Elfa sale typically runs in January and September. Mark your calendars! 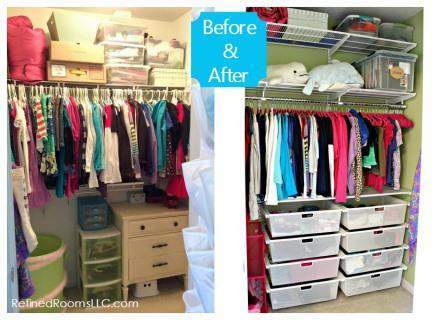 Is there a closet makeover in your future? « CREATE YOUR DIGITAL PHOTO BACKUP SYSTEM TODAY! That’s fantastic. 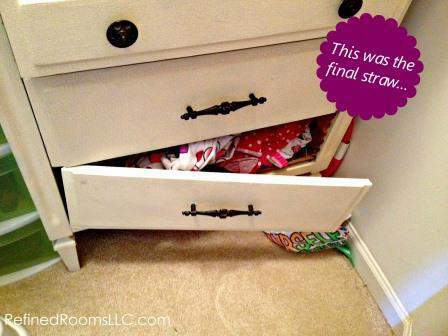 May I assume that with all those drawers in her closet, she doesn’t need a separate dresser? That would be a tremendous space-saver, with so many bedrooms being on the small side. Looks amazing! You’re very talented and have a lucky little girl. Looks lovely. Of course, I love that you are making use of every square inch, now. Isn’t that one extra shelf up above worth every penny??? Glad your daughter loves it! Thanks for stopping by! Yes, the addition of that extra shelf made me feel “whole”, since I knew there was plenty of room for one more! She now has so much shelf storage space that we have room to grow up there. That’s always a good thing!